Today my baby www.lulupu.com turns 1! Am super happy and oh so excited! Yeah! I cant believe its been an year already.... it still fees like yest when i dreamt about it. It's been a totally exciting journey especially for me to watch my dream turn into reality and I couldn't have done it without each and everyone of you! Thank You! 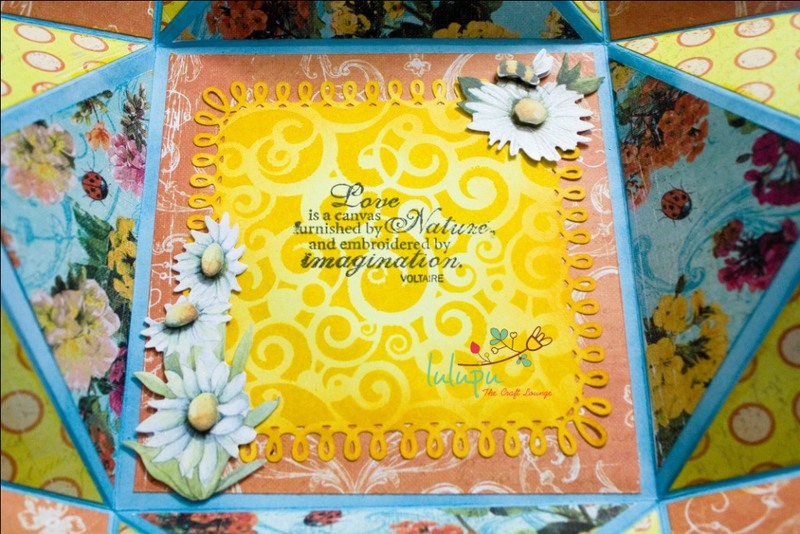 March will be going to be fun at Lulupu - The Craft Lounge! We will have many giveaways and tonnes of fun so do ensure you follows us all around FB, Twitter, Pinterest and Youtube! 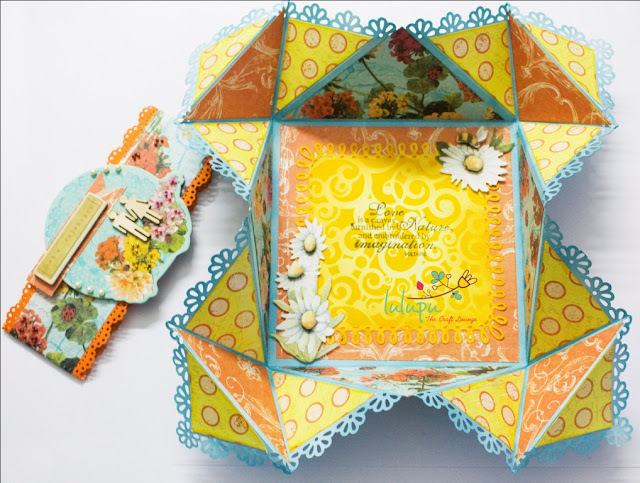 To kick start the celebration we have a Lulupu Design Team Blog Hop along with our monthly challenge. So if you have landed at this post its the very start for a fun filled week ahead! which totally got me cracking. It was so pretty that i wanted to try it for myself so i was inspired by the folds and here is my take on it. Well, unlike Ujjwal i aint any good with handmade flowers so i went straight ahead for the latest Prima Marketing Zhypher collection. 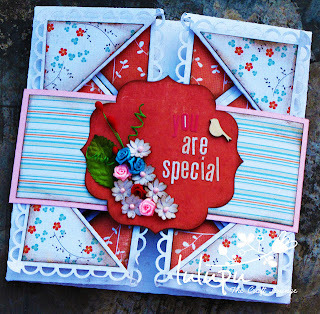 What my card shows is how a particular paper collection and coordinating embellishment can complete your cards/projects super quick. This one was a breeze! Studio Calico Wood Veneers are my latest crush and i love how they complete all my projects so aptly. The chipboards are again from Zhypher Collection. Love em! It reads "Let's Celebrate". Can you see the Pie Lane Glitter Balls? Here is a look at the open card. I have used the Crafters Companion Cosmic Swirls to create the effect with Distress inks. Added the K&co Layered Accents Stickers and a stamped sentiment and voila you are done. See how easy peasy it is. Hope you liked it and am guessing you are gonna join us in Lulupu Challenge #10 too. Thanks for passing by. Continue the Lulupu Design Team Blog Hop with the next post on 3rd March By Ujjwal. Also here is the list to help you track the blog hop ending on 9th March. Wow karuna. My best wishes to you and your team for this great success. happy birthday lulupu. happy to participate in this blog hop. Wow ! happy Birthday Lulupu and I am so proud and happy to be a part of this team.Loved your beautiful card. congratlations on completing a yr...lovely colours...card is so bright and beautiful!!! congo on first birthday ,lovely card with bright colours ,its fun making this napkin fold ..i too love doing it. Its beautiful card. I love the papers you used. Still remember that explosion box those papers were still in my memmory.... have to buy from u it seems.. :). Great card, i love how you took inspiration and yet turned the card into something so different! Great work! Congratulations on Lulupu's first Anniversary...hope there ar many more to come. This is so tempting..!! wonderful colors..!! congratulations and hearty wishes for LULUPU.. way to go..
Congratulations Karuna on Lulupu's first anniversary.....keep up the great work! Wish you all the very best for the forthcoming years! Love the colour combination of your card..
Wow I love this fold and in these days this fold has become quiet popular...thanks to lulupu..love the bright colours in your card Karuna and the way you have use pp is awesome..card is looing so complete even without flowers..good choice of papers !! Congratulations on 1 year and wish you many more beautiful inspiring creative years ahead. Thank you for starting Lulupu - now I can buy all my craft supplies that I have dreamed of or pleaded with friends and relatives going abroad to get me...thank you once again and all the very best!! Hey karuna... congratulations and wishing you all the best for Lulupu..
Wow ! 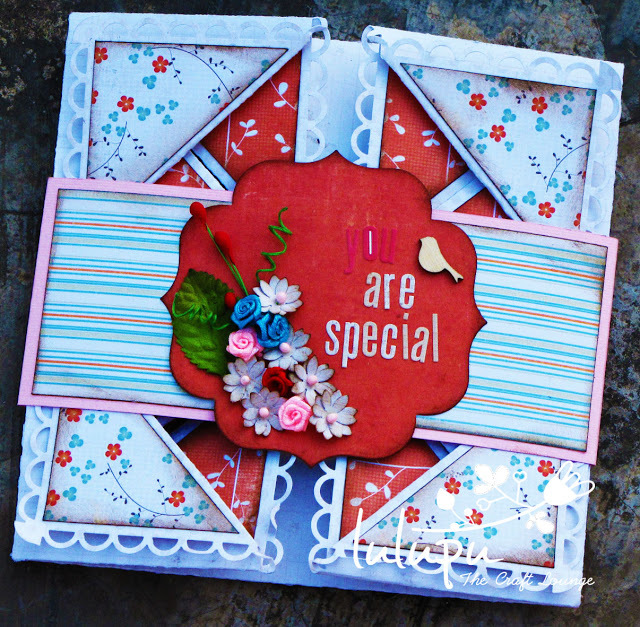 Beautiful card with bright colors ! Congrats to lulupu for 1st blogoversary. Wishing all the best for the future journey ! Congratulations and good luck for lulupu..!!! Congratulations on completing a year and wish you all the best for coming years. Loved the card. 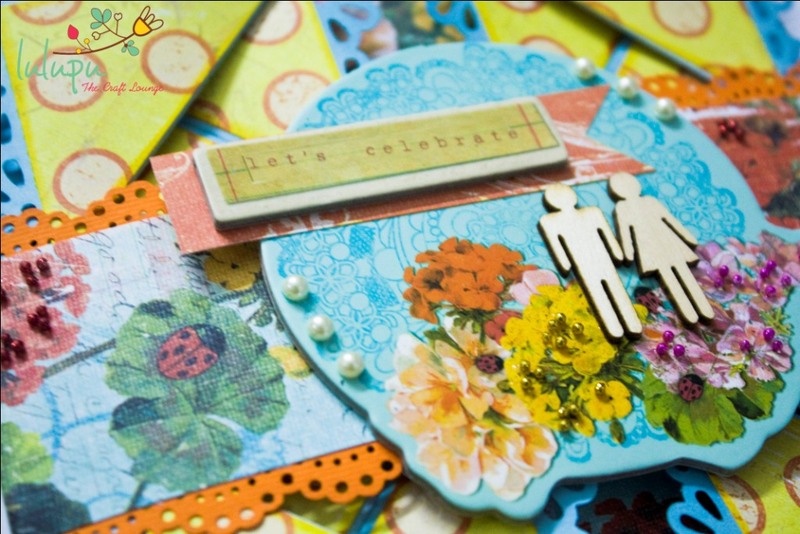 papers embellishment everything is just gorgeous.